Each player leads an ancient civilization from its earliest beginnings to become a world power. The game actually plays out through 3 ages. In these ages, the players start with 7 cards and they choose one card to play and pass the rest to the next player. This process continues until only 2 cards are left at which time they play one and discard the other. The playable card deck consist of 155 cards. Most cards have requirements. They can require you to have certain resources or purchase them from another player. Some cards allow you to build for free. The cards can also be discarded for 3 coins or used as a stage of your wonder. Red cards add you military strength. Yellow cards grant coins, resources and victory points. They also decrease the cost of buying resources from neighbors. Green cards have one of three symbols. Combinations of these symbols are worth victory points. Blue cards grant a fixed number of victory points. Brown cards provide raw resources (wood, ore, clay brick and stone). Grey cards provide manufactured goods (glass, papyrus and textiles). Purple cards grant victory points based on the structures a player and/or his neighbors have built. The brown and grey cards may only appear in the Age I and II decks, while the purple cards only appear in the Age III deck. After each age, the players compare their military (thus gaining or losing points). After the 3rd age, the players count up points for military conquests and different kinds of buildings built and the player with the higest victory points wins the game. They players are free to develop their civilization how they want. They can establish a military powerhouse or a merchant state. Also a civilization can master science and technology or even build a world wonder, but you're not penalized if you choose not to build one. Depending on which region the player controls in the ancient world, they can build one of the Seven Wonders: The Hanging Gardens of Babylon, The Pyramids of Giza, The Lighthouse at Alexandria, The Colossus of Rhodes, The Temple of Artemis at Ephesus, The Mausoleum of Halicarnassus and The Temple of Zeus. 7 Wonders is a simple and addictive family game. The game is easy to learn. Most beginners figure out already a solid strategy by the 2nd or 3rd play. The game is quick to set up and the game play is fast. Most games take around 30 minutes so you can play several games on one evening. The game can be played with 2-7 players, although the 2 player game is a variant. Even when you play with seven players, the game play won't be too long as players make decisions at the same time. 7 Wonders was created by Antoine Bauza and released in 2010 by Asmodee Games. The game won more then 30 gaming awards including 'game of the year' in 2011. 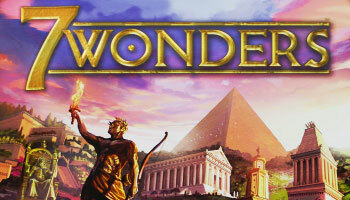 7 Wonders Duel is a game for 2 players in the world of 7 Wonders, the best-selling board game. It uses some of the main mechanics of its older brother, but offers a new challenge, especially adapted for one-on-one games. Each player is leading a civilization and will construct Buildings and Wonders. All of the Buildings constructed by a player together with their Wonders are called a "city". This expansion for 7 Wonders gives you the chance to discover another aspect of the great cities of Antiquity. 27 new cards offer you brand new buildings with never before-seen effects. 3 Guilds, 6 Leaders and 2 Wonders complete this expansion. 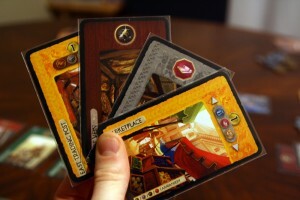 7 Wonders Cities allows up to 8 players at once and also offers a team variant. This expansion for 7 Wonders offers you the opportunity to put leaders at the head of your civilization. Represented by 36 new cards, these leaders will influence the growth of your city, each in their own way. The game play is slightly changed, but the victory conditions remain the same as those in the basic 7 Wonders game. This expansion for 7 Wonders Duel offers players the ability to invoke powerful Divinities to benefit from their powers. During Age I, the players will choose the Divinities they will be able to invoke during Ages II and III. Grands Temples make their appearance and are substituted for the Guilds. 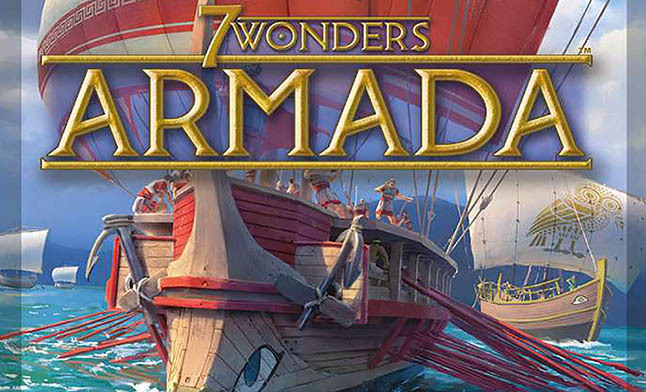 This 7 Wonders expansion allows you to build fleets of Ships to conquer the seas. New Armada and Island cards enrich the game and increase the interaction between players. The flow of the game is slightly changed, but the victory conditions remain identical to those of the base game of 7 Wonders. Babel is made up of two expansions, which may be played together or separately. Special Rule : the Stages of the Great Wall can be built in any order, at the player's choice. Clarification : The player must choose the Stage to be built before the other players reveal their action. Stage 1: The player takes 8 coins from the bank and adds them to their treasury. Stage 2: At the end of the game, the player gains an extra scientific symbol of their choice.